Congrats to DFSArmy coach @dfsupnorth on his great FanDuel lineup! In my initial preview I left stating I had JT > Hideki > Schaufelle > Rahm. As the week went on, and as I wrote in my notes I personally had Hideki as my favourite, followed by JT while being underweight on Rahm and completely off of Schaufelle. These four all performed well with top 15 finishes (1.5 DK point difference between Hideki, Rahm and Schaufelle) however, JT stood out fromthe pack with his third place finish. Phil was another guy I liked this week, (I liked almost all of this $9k range looking back at the notes) but like Tony, Phil failed to make the cut and really hurt a bunch of my line-ups. As the week went on I wrote in my notes that I liked An the most, followed by Putnam, Reavie, Champ and Noren. Ultimately, Reavie and An were the ones you wanted in your player pool for the week. A guy I liked for the week was Sungjae Im, who did not disappoint with his top 10 finish. Im was a great value whose ownership was lower than it should have been with guys like Glover and Kokrak at the same pricepoint. There were plenty of others that I liked and disliked that were mentioned in my notes, some worked out and some didn’t – overall, while I had success in cash I struggled in GPP’s for the week with lots of 4/6 or 5/6 line-ups as key players for me missed the cut. Weather plays a part this week more so than most. With three courses there can be an advantage to playing the draw and avoiding Pebble when the weather is at it’s worst. I think people usually overreact to weather, but this is a week where at the very least you should take the weather into consideration. This event takes place at three separate courses and while most of the focus goes to Pebble Beach itself, I think the other two courses should be taken into consideration in your picks – find the guys who can go low and put themselves in a good position. I love DJ at this event, as do most, and I love DJ at this price. I understand the field is (a little) better than the week prior but with what we’ve seen this year ill take DJ at $100 less than Rahm every day of the week. DJ looked dominant last week in Saudi Arabia and has finished no worse than T16 in his three events this season. Also, we have seen ownership spread out somewhat amongst the top salaries in the last two weeks. While I expect DJ to be the most owned of those above $10K if we are seeing ownership spread out I love the thought of being overweight a 20-25% owned DJ. Off the top Day jumps out of you because of his T5 finish last event and his great course history. As usual with the top salaries it is hard to dislike any of the options. I think we could see Finau as the lowest owned coming off of a missed cut where plenty were burned, but as I mentioned above I could also see ownership spreading amongst the four. I personally like Day >Fleetwood>Kuchar> Finau at this moment, but that will likely change as the week goes on and ownership is easier to analyze. This range is extra interesting after @DFSupnorths article/tweets about how he is shocked Reavie is given a higher likelihood to win the tournament compared to the other three according to the bookies. I agree with the sentiment BUT I think for DFS purposes the pricepoints being the same to me makes sense. There is some guys that close out events and others who do not, Reavie is playing great golf and it might just be variance, but in the last 10 years Reavie has one win compared to Casey’s 8, Reeds 6 in less time and Scotts 14 (although he has none in the past two seasons). Luckily for DFS purposes, we don’t need Reavie to win if he’s on our team as we have five other golfers who can do that for us. If Reavie can get a top 10 he more than exceeds value and given the way he plays I wouldn’t be surprised to see it. In this group I currently like Reavie>Casey>Scott>Reed. I am writing up these two together because it’s two guys I have been on the last few events and neither has disappointed. Kokrak has three straight top twenty’s this season and while Im had a T52 he has also come top 16 in his other three appearances this colander year. Based on how they have been playing I am fully okay with the price on both players and will be on both this weekend, although I do currently favour Sungjae over Kokrak on course fit – we will see how the draw, weather and expected ownership changes that thought. A string of missed cuts heading into the Waste Management kept me off of Hadley last week. The T20 finish could have easily been a top 10 if you take out a few small, fixable mistakes. I like Hadley this week. The Team (2-2) Back to .500! This week I had a much tougher time finalizing my roster than usual. 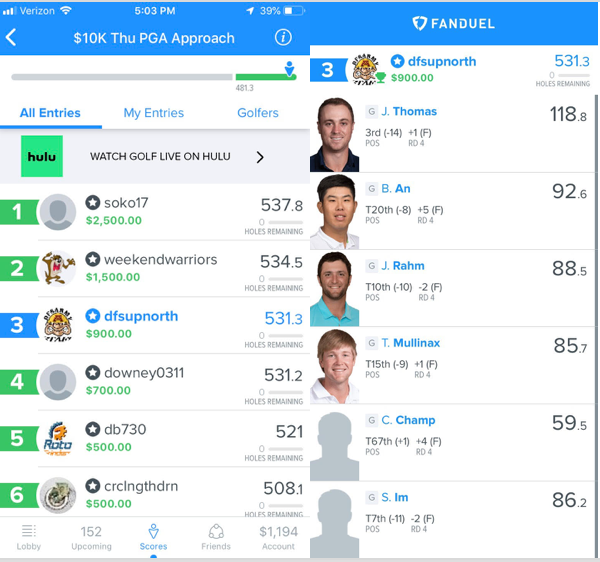 I was set on Fowler up top and Im/Glover down low, I really wanted Finau if I could fit him and from there I was in between on the rest of the guys I wrote as cash in my end notes. Ultimately, Reavie was near the bottom of my final list based on his price but he ended up fitting absolutely perfectly from a financial standpoint. Usually, I hate basing my plays off of that, I think it’s a big disadvantage to base your final decision on a guy who fits. As mentioned, I locked in three, decided I wanted Finau as well, plugged in Grillo, which didn’t leave me enough for Kuchar but left me with money on the table. From there I had Reavie as my next highest salary I liked, then used the extra money to upgrade Grillo to Bradley. Not the prettiest roster construction and not one I felt terrific about going into the week, but a win’s a win (thanks Rickie & Chez).